Listen to the fool’s reproach! it is a kingly title! I love the symbolism of Pi Day. I love it as an example of how we can take something that is so utterly rational and mathematical — the ratio between the circumference and diameter of a circle — and turn it into something so whimsical, interpretive, and symbolic. I love how we can take something so basic as a number and use it as an occasion to post pictures of a baked good on social media. Pi Day can be an educational event, a way of helping us all appreciate the importance of mathematics; but it is also an affirmation of human beings’ ability to make meaning out of something that seems to be dry, abstract fact. And it is a glorious instance of the joy of puns. I think it’s worth stepping back for a moment to observe carefully all the different layers of meaning that have gone into the symbolism of Pi Day. First, we have the fact that many ancient cultures discovered a constant value for the ratio between the circumference and diameter of circles. From that ratio is derived a number, often rounded to 3.14 in decimal representation even though the actual number continues beyond these first three digits in a non-repeating, non-terminating series. Then we have the custom, apparently adopted by European mathematicians during the eighteenth century, of using the Greek letter π as a symbol of this number. It may seem odd to use a letter from the Greek alphabet to represent a number, but in fact, the Greeks did this too; they actually used the letter π to represent the number 80, although they usually wrote it as π’ to distinguish it from the more common use of π as representing a “p” sound. Next, we have the custom of attributing symbolic significance to marking the fourteenth day of the third month of the year (according to the modern western calendar system, at least). In the American system of writing dates, where the month precedes the day, we therefore have 3/14. Strictly speaking, it has no mathematically significant relationship to the number π at all, but so what? The fact that the same pattern of digits or numbers can be applied both to a mathematical constant and to a given date on a calendar is completely random, but its randomness need not impair its significance. We can make meaning even where none existed before. In turn, we have the quirk whereby the letter π is pronounced in modern English in the same way that we also pronounce the word “pie.” In modern Greek, the letter iota, or ι, which is the equivalent of our Roman-derived “i,” is pronounced as “ee,” and this is probably how the ancient Greeks pronounced it as well. But many dialects of English pronounce the letter “i” as “aye” or ai. So π becomes “pie,” or /paɪ/ in the International Phonetic Alphabet. Finally, and perhaps inevitably, a connection is made between the English pronunciation of pi and the baked dish known as “pie,” so that people bake pies for Pi Day and post pictures of them on the internet. Now, I know some readers may be thinking, “well, duh, all of this is obvious. Why did you need to explain all of these steps?” But to me, it’s not obvious. Sure, anyone who sits down to think through all of the steps behind Pi Day can probably figure out the points I’ve listed above. It may also be that someone other than me can present a more detailed history of how some of these steps happened. (Take these two Slate articles by Joseph Mazur, for instance.) But what fascinates me is how we can make leaps of meaning between such incredibly divergent systems of signification — from a numerical ratio in geometry, to a letter in an alphabet, to a date on a calendar, to a conventionalized phonetic pronunciation, to a silly pun, to a familiar element of American (and European) culinary culture. I love how this entire process starts with something so logical and mathematical and then ends up being a series of almost-absurd connections of meaning that have no overall pattern or systematic coherence. 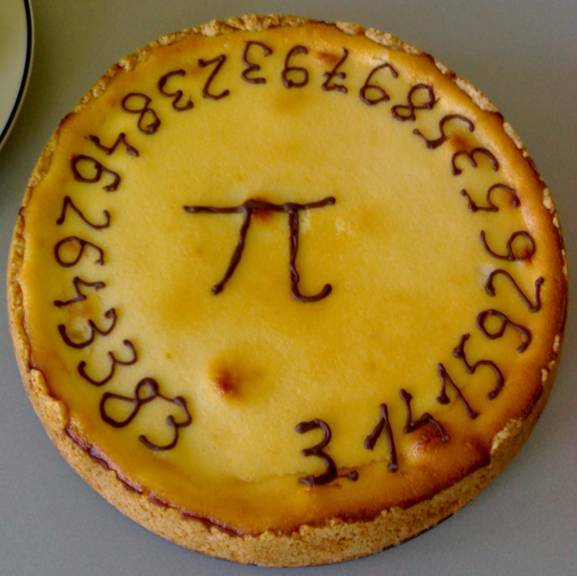 The symbolism of Pi Day is a perfect example of a kind of phenomenon that I enjoy exploring on this blog — how, when you examine the history of something, you can find that its meaning sometimes emerges or evolves in varied and unpredictable ways. In modern scientific society, we tend to pride ourselves on rationalism. We often look down on numerology and other forms of number-symbolism; we think that numbers are just numbers, that there’s no real significance to them other than mere quantity, and we often assume that people who believe in number-symbolism — fearing the number thirteen, for example — are superstitiously looking for meaning or significance where none exists. But why should we let our rationalism get in the way of appreciating the whimsical symbolism of Pi Day? (It’s worth noting, by the way, that π is an “irrational” number by mathematical standards. The mathematical meaning of the word “irrational” differs from its more common meaning, of course; but I think that’s all the more reason to consider it a great pun.) Even the blogger Vi Hart, who has argued that π isn’t as mathematically special as some believe, still has one of her satirical anti-Pi-Day videos feature the making of pies. Every year, when Pi Day comes along, we highlight the most famous irrational number in mathematics; but for me, it’s an opportunity to celebrate the not-always-rational process of how human beings make unexpectedly meaningful connections between vastly different domains of experience. Several days ago, I happened to catch a few moments from the 1950’s science fiction film Them! on television. In one scene, a man and several children are trapped in an underground space, and are being threatened by gigantic, monstrous ants. The man helps the children to safety, but then one of the mutant ants comes up behind him and traps him in its jaws, causing him to scream. Almost as soon as I heard this scream, I thought to myself, “have I heard that somewhere before?” I remembered seeing internet articles within the past few years about something called “The Wilhelm Scream,” a famous movie sound effect. I had a hunch that maybe this man’s scream from a scene in Them! was an instance of this sound effect. Sure enough, upon researching the Wilhelm Scream on Wikipedia, I found that the sound effect was indeed used in this scene of Them! The Wilhelm Scream is a highly dramatic recording of a man screaming — actually, it probably sounds melodramatic and exaggerated to many modern ears — and it has been used in a number of different movies since the 1950’s. (The first Star Wars movie is one example of a popular modern film that uses it.) Until reading the Wikipedia article on this sound effect, it never really occurred to me that films would use stock sound effects in the same way that visual media sometimes use stock images. But once you think about it, it actually makes sense. Stylized or conventionalized images or sounds can be a convenient shortcut for filmmakers putting together the details of a movie. If a scene in your film requires an agonized male scream, and a pretty dramatic one has already been recorded and is available as a stock sound effect for you to use, why go to the trouble of recording your own when you can just use the stock effect and save money and other resources? Of course, if many films use the same effect, then it becomes very easy to parody it or use it as an inside joke, and it’s not surprising that this ended up happening in the case of the Wilhelm Scream. But whether it’s used for parody or whether it’s played straight, the Wilhelm Scream fascinates me as an example of a conventionalized technique that is used in an artistic medium that people often associate with individualism, realism, or (supposedly) non-symbolic storytelling. It seems to me that modern audiences typically expect all the voices in a movie to be “realistic” or reflective of individual people (usually the actors who are playing the characters). According to this logic, the sound of a character screaming will be perceived as more “realistic” if you actually go to the trouble of recording the actor screaming in a moment specifically arranged for the film, making the scream sound as individual and as “true to the character” (or at least to the actor) as possible. But the use of the Wilhelm Scream suggests that this assumption does not always hold true. Under certain circumstances, a conventionalized, prerecorded scream can stand in place of an actual “real” scream. Modern audiences often bristle at the idea that art involves such conventions. We tend to look down on clichés or any other element in a work of art that we’ve seen somewhere before, because our culture has a notion that great art is supposed to be original. The more that we are made aware of conventions at work in a book, or a movie, or a piece of music, the more we tend to judge that piece of art as unrealistic or unoriginal. We also tend to assume that only a very inferior or untalented artist would descend to using stock techniques like a prerecorded sound effect or a piece of stock film footage. The most common way of recognizing conventions is to parody them, a response that usually involves a negative value judgment on both the conventions and the works of art that use them. And yet, once you start looking for them, conventions and stock techniques are everywhere, and even the most famous artists use them. Michelangelo Buonarroti is often seen as a paragon of artistry in western culture, a prolific genius and embodiment of inspired creativity. According to some observers, part of the secret of his prolific output is that he often re-used many of the same elements of his depictions of the human anatomy in different pieces. Michelangelo’s work on the Sistine Chapel is sometimes seen as a triumph of western art, an extraordinarily elaborate design crowded with tremendous detail and many different human figures. But Ross King argues that “it was precisely because Michelangelo had a most retentive memory that he was able to generate, in a short space of time, so many hundreds of postures for the Sistine’s ceiling.” King contends that various details of the ceiling’s painting of the Delphic Sibyl, for example, are based on diverse elements cobbled together from many different depictions of the Virgin Mary that were painted by Michelangelo before he worked on the Sistine Chapel.¹ Understanding that Michelangelo sometimes reused elements from earlier pieces when crafting a new work of art need not lessen his achievement as an artist; on the contrary, it can make it easier to understand and appreciate the sources of his creativity. Sometimes creativity involves reusing or repurposing what is old, rather than simply creating something “original” out of nothing. Bloggers, too, sometimes make use of conventions or stock techniques. My blog currently uses WordPress’s “Syntax” theme to organize its layout and set its visual style; this theme is relatively new, but my blog is hardly the only one that uses it. And on at least one occasion, WordPress’s “Blogging 101” course that gives new bloggers advice on the craft of blogging has offered pointers on how to use stock images on a blog. (Unfortunately, I can’t find that particular post right now, or I would link to it.) I myself have not yet managed to work specific images onto my blog. I’m not too worried about it, since my blog emphasizes writing and text as the most important elements anyway, but I do plan to incorporate images and visuals in some future posts. Using stock images isn’t something that I really thought about before I started blogging, but I can see how they might be useful, especially if you’re not a professional or highly talented photographer or visual artist. Again, creativity need not be a matter of whipping up something out of nothing; sometimes it’s a matter of making good use of materials you’ve already been given. So, there are definitely reasons to use conventions and stock techniques from the point of view of someone creating a film, or a blog, or a painting. But to me, the use of these elements also reflects the social and symbolic aspects of art. Our culture tends to have a view of art as the creation of lone geniuses who toil in isolation to produce works of towering originality. Maybe there is some truth to this picture; many people who do creative work need some time alone in order to concentrate on their craft. But artists also borrow a great deal from the societies in which they live, and so they necessarily draw on conventions that are shared with other people. And when many different works of art incorporate the same conventions, they create a shared symbolism, a pattern of meaning that recurs throughout a wide variety of works by different authors or artists. If we always insist on realism and individualized authenticity, then we might get to the point where we are able to appreciate a conventionalized technique like the Wilhelm Scream only when we’re making fun of it. To me, that’s unfortunate, because shared symbolism and shared conventions help to remind us of our common humanity and the social bonds that draw us together. I would even argue that realism and individualism are themselves a kind of conventional thinking, one that resists acknowledging its own conventionality; but that’s a subject for another post. In the end, I think that modern technology helps feed our desire for realism and individualism, but it can also give us tools to make it easier for a wide audience of people to discover conventions and other recurring patterns in art, as sites like Wikipedia and TV Tropes demonstrate. With these kinds of tools, we can remind ourselves of how artists create, and why we appreciate what they make. 1. Ross King, Michelangelo and the Pope’s Ceiling (New York: Walker & Company, 2003): 171. What does the word “classical” mean in our modern world? In previous posts, I’ve stated that this blog is loosely modeled on the tradition of the classical prose miscellany. In this context, the word “classical” refers to ancient Greek and Latin cultures. I’ve been interested in classical Greek and Latin literature and history since I was in college. A great deal of later literature that I’ve studied has been influenced by Greek and Latin texts. While the posts on this blog may be on a wide variety of topics, I expect that the influence of classical literature and history will come up repeatedly as a recurring theme. My focus on Greek and Latin “classical” culture has been shaped by my own background and education. At the same time, though, I recognize that the word “classical” — while it originally derives from Latin — need not refer only to works written in Greek and Latin. If we take a broader view of world history, we can recognize that there are many ancient and classical traditions across the globe. In addition to classical Greek and classical Latin, one may also speak of classical Hebrew, classical Sanskrit, classical Chinese, and classical Arabic, to name only a few examples. Some might argue that recognizing non-western or non-European “classical” traditions is a symptom of creeping political correctness or revisionist history. To me, though, such an argument is short-sighted. The fact is that even what we consider to be “modern western culture” has been influenced by non-western traditions. If I write today’s date as “February 4,” the word “February” derives from Latin, but the numeral “4” descends from an Arabic numeral that was itself derived from an earlier Hindu script. The Romans themselves apparently wrote the number “4” as “IIII” or “IV.” Today, although we in the modern western world use letters based on Roman letters, our written numbers are based on a Hindu-Arabic numeral system. Acknowledging this situation is simply to recognize historical facts. Gregory Crane, a classics professor at Tufts University, makes a comparable point in a recent post on the blog of the Perseus Project. (For readers who are not familiar with this online resource, the Perseus Project is a historical library or archive of digital texts. Many works in its collection are written in Greek or Latin, but it also includes other works in languages such as Arabic, Old English, or Old Norse.) Noting that Tufts University is currently seeking to hire a professor “who studies the contact between the Greco-Roman and Islamic traditions[,]” Crane uses this circumstance as an opportunity to reflect on what the word “classics” means in a modern context. He observes that academic Classics departments have sometimes had difficulty recognizing the value of classical traditions beyond the Greek and Roman ones that western academics tend to be most familiar with. Crane then distinguishes three possible ways of dealing with this issue: 1) abandon the term “classics” completely and instead focus on “Greek and Latin Studies”; 2) focus on philology and historical languages; 3) encourage a broader understanding of the word “classical,” one that can include other traditions alongside Greek and Latin. Crane himself seems implicitly to endorse the third option. One reason why Crane thinks that people who study “classics” need to recognize the legitimacy of other classical traditions is because of the historical influence of Islamic and Arabic cultures on the later continuity of the western classical tradition. As he suggests, medieval western Europeans learned about the philosophy of Aristotle, the mathematics of Euclid, and the medical writings of Galen largely through Arabic texts that were preserved in Islamic traditions and then translated into Latin. In this way, medieval Islamic traditions had an important influence on the medieval and modern preservation of certain parts of the classical Greek tradition. I must confess that there is one part of Crane’s post that I would quibble with. He writes that “if it were not for work done in Baghdad from 800-1000 CE and the transmission of knowledge into Latin c. 1200, there would not have been a Renaissance[. ]” From my perspective as a student of Renaissance history, this seems to be something of an exaggeration, based on the widely-held assumption that Greek philosophy and science were the only truly important aspects of the rebirth of learning that took place during the Renaissance. It is quite true that most western Europeans in the Middle Ages learned more about Greek philosophy, mathematics, medicine, and science from Arabic texts and intermediaries than they did from Greek texts. It is also true that this Arabic influence persisted, in some ways, into the Renaissance and the modern world; this influence helps to explain why it is that we use Arabic numerals instead of Roman ones. But to say that the Renaissance would never have happened without Islamic influence is to press the case too far, in my opinion. Renaissance humanist scholars learned about the Greek tradition not only from medieval Latin translations of Arabic texts, but also from Greek texts that were preserved for centuries by Byzantine scribes and scholars. Indeed, in many cases, western humanists preferred to use Greek texts instead of texts derived from the medieval Arabic-Latin tradition. In addition, the Renaissance was about more than just the rebirth of Greek traditions of philosophy and science; it also witnessed a revival of Latin traditions of literature and rhetoric, some of which were not very much influenced by Islamic or Arabic traditions. The quattrocento revival of Ciceronian style, for instance, had little to do with Arabic texts (as far as I am aware). Instead, it was dependent on Latin texts of Cicero’s works preserved by medieval European scribes. The Renaissance was a historical phenomenon that combined a number of different influences from a variety of sources. Medieval Islamic learning was one of those sources, but it was far from the only one. Still, despite this quibble, I find myself in agreement with Crane’s larger point: Recognizing a multiplicity of classical traditions is important, both for understanding how those classical traditions have influenced each other, and for maintaining a historical perspective on current conflicts between cultural traditions in the modern world. While Crane may be putting his case rather strongly when he writes that “Islamification, in a sense, already happened a thousand years ago[,]” his point is still worth considering despite its rhetorical exaggeration. When so-called “anti-Islamification” protesters march in Germany, or when some Americans take offense at the Arabic word “haboob” being used in western media to describe certain weather phenomena, it’s important to remember that Islamic traditions have been influencing our “classical” western traditions for many centuries. This doesn’t require that all of us who are non-Muslims will suddenly become “Islamified,” whatever that means. It does suggest, however, that trying to get rid of all Islamic or Arab influence is futile — as futile as thinking that we could suddenly go back to Roman numerals after centuries of using Arabic-derived numerals. Recognizing the influence of other cultures on Greek and Latin classical traditions goes hand in hand with recognizing that there are other classical traditions besides the ones we may know best. So the concept of a “classical” tradition is, and should be, a flexible one — anchored in historical usage, but also able to be extended into other domains as well. That’s the way I plan to continue using it on this blog. I’ve been maintaining this blog for a few weeks now. I’m delighted that I have a few followers already, and it’s nice to have even a modest number of likes and views on some of my posts. I’ve even received some very encouraging feedback from an experienced blogger after I had commented on a post on that writer’s own blog. It’s great to know that the things I’m writing here are interesting to some people — especially to other people who also write blogs of their own. I’m sure every person who starts a blog dreams of being read by millions of people all over the world. I guess on some level, I do, too. But right now, I’m okay with the fact that the group of people who read my blog is small at first. I want to think of my readers as being part of a community, and starting out small gives things a more intimate feel. Now of course, I may be jumping the gun a bit with the whole “community” thing. My blog has a ways to go before it will feel like a comfortable spot for a community. As of this post, I haven’t settled on a nice header image or a snappy gravatar yet. It may be a while before I get around to setting up a blogroll. I’m aware that there are lots of things I could be doing to encourage more readership, more comments, more interaction. I’ll get there, eventually, but I learn these things slowly, and it will take some effort for me to incorporate them into my blogging routine, as opposed to the writing, which comes much more naturally. One thing that gives me hope that I will eventually be able to take more advantage of the social aspect of blogging is the fact that WordPress, the blogging platform I’ve chosen, uses many social-media strategies to build and maintain a community of bloggers. I wasn’t really expecting this when I decided to start a blog, because I was focused on what I wanted to say, and how I could best say it. But I suppose, in hindsight, that it’s a pretty obvious move. Social media platforms like Facebook and Twitter generate huge amounts of traffic by encouraging interaction between users, so it’s no surprise that a blogging platform would use many of the same strategies — suggesting new blogs for you to follow based on your previous activities, creating forums where bloggers can meet and help each other, arranging notifications and “new post” feeds in the same way that social media sites do, and so on. I’m clearly late to the party as far as all of this is concerned. No sooner had I thought up the phrase “blogging as social media” than I put it into a search engine and turned up numerous results that either used the exact same phrase, or made a similar point. Still, even though it’s not a new point, I think it’s worth dwelling on the social, interactive aspect of blogging. It’s especially interesting to me to think about how blogging can be a dialectical medium as well as a rhetorical one. Bloggers are sometimes depicted in an unflattering way as self-obsessed narcissists who love to get on their soapboxes and broadcast their points of view to a society that has more important things to worry about. And it’s true that the temptation to make a blog “all about me, me, me” is always there. Those of us who like to write, or who engage in other creative outlets, place great value on self-expression. At the same time, it’s helpful to be reminded of the social, interactive aspects of blogging. Reminding me that I’m not just a writer with something to say, but that my blog has readers who are interested in what I say, and who have their own perspectives on what I say, and who sometimes might even share those perspectives with me — all of that is valuable along with self-expression. I think a lot about the balance between communication and expression when I’m considering what topics to write about. I have strong political views on certain topics, for example, and so I sometimes feel the temptation to make a post ranting about some political topic or other. But then I consider that maybe the internet already has enough of those kinds of rants, and that maybe it would be better to approach the topic in a less heated way. Respecting other peoples’ points of view isn’t always easy, especially when they disagree with you about a topic you feel strongly about. The internet makes it very easy for us to retreat into our corners and fragment ourselves into self-selected groups where we know that everybody already agrees with us. It also makes it easy to hide behind a screen of anonymity and hurl insults and abuse at people because they have different views (or sometimes because of no reason at all). To my mind, these well-known negative aspects of the internet give us all the more reason to do everything we can to maintain a dialectical approach to what we do. For me, that means reminding myself that having a blog is not just about me having something to say (although that is important). It’s also about being part of a community of people who each have their own points of view, and who write blog posts because they are interested in exchanging those points of view with others. And if people outside the WordPress blogging community are also interested in what we say, so much the better. So I’m grateful to be part of a community of people who write about their points of view. My place in that community is small for now, but that’s okay; it gives me a stable foundation to build on. To those who are already reading my blog: thanks. A blog is written not just to say something, but to be read, to connect with others. Having actual readers is the best reminder of that principle. Agitation and the chase are properly our quarry; we are not excusable if we conduct it badly and irrelevantly; to fail in the catch is another thing. For we are born to quest after truth; to possess it belongs to a greater power. I’ve heard about similar research (though unfortunately I can’t remember the source at the moment) suggesting that engaging in a routine or repetitive task frees the unconscious mind to concentrate on drawing new connections between ideas, which in turn leads to innovative or “creative” thoughts. Whether it’s through boredom, as Mann suggests, or through routine activity, to me the effect is the same: allowing the mind to let go of a singular conscious focus often helps the creative process, instead of hindering it. It is fascinating, though, to watch scientists and researchers explore these aspects of the mind that we tend to think of as non-rational. The “unconscious” part of the mind would seem to be very difficult to study through empirical science, since by definition it operates “behind the scenes,” so to speak, away from our conscious powers of reasoning and observation. And studies like these always raise the question of what kind of thinking counts as “creative” or “innovative” or “original” from a scientific point of view. Still, it’s interesting to have another perspective on the kind of thought processes that drive creativity. When I was preparing to start a blog, I thought for some time about a possible theme. I was somewhat uncomfortable with the idea of writing a blog that was like a personal diary, or a blog that was about any random thing that happened to me at a given moment. Of course, there are plenty of blogs like those out there, but they’re just not for me. Some very successful blogs focus on a specific theme or subject matter. However, I am interested in too many things to be able to restrict a personal blog to just one theme, even if I defined that theme really broadly. So I needed a way to turn this trait of mine to my own advantage, to make it work for me rather than against me. [I]n the arrangement of my material I have adopted the same haphazard order that I had previously followed in collecting it. For whenever I had taken in hand any Greek or Latin book, or had heard anything worth remembering, I used to jot down whatever took my fancy, of any and every kind, without any definite plan or order, and such notes I would lay away as an aid to my memory, like a kind of literary storehouse, so that when the need arose of a word or a subject which I chanced for the moment to have forgotten, and the books from which I had taken it were not at hand, I could readily find and produce it. It therefore follows, that in these notes there is the same variety of subject that there was in those former brief jottings which I had made without order or arrangement, as the fruit of instruction or reading in various lines. …some called their books “The Muses,” others “Woods”, one used the title “Athena’s Mantle”, another “The Horn of Amaltheia,” still another “Honeycomb,” several “Meads,” one “Fruits of my Reading,” another “Gleanings from Early Writers,” another “The Nosegay,” still another “Discoveries.” Some have used the name “Torches,” others “Tapestry,” others “Repertory,” others “Helicon,” “Problems,” “Handbooks” and “Daggers.” One man called his book “Memorabilia,” one “Principia,” one “Incidentals,” another “Instructions.” Other titles are “Natural History,” “Universal History,” “The Field,” “The Fruit-basket,” or “Topics.” Many have termed their notes “Miscellanies,” some “Moral Epistles,” “Questions in Epistolary Form,” or “Miscellaneous Queries,” and there are some other titles that are exceedingly witty and redolent of extreme refinement. A work with a similar title, written well after Gellius’s time, is the Varia Historia. Its author, Claudius Aelian, was a Roman sophist from the town of Praeneste, but like many literate and cultured Romans of his era, he enjoyed dabbling in Greek prose composition. (Even the Roman emperor Marcus Aurelius famously wrote his philosophical Meditations in Greek.) In its original language, Aelian’s prose miscellany is entitled Ποικίλη Ἱστορία (Poikile Historia). The first word in this phrase, poikile, literally means “many-colored” or “variegated.” (In the Septuagint, the ancient Greek translation of the Hebrew Bible, this same word is used in Genesis 37:3 to describe Joseph’s coat, and thus the King James Bible, influenced by the Septuagint, refers to Joseph’s coat “of many colours.”) So Aelian uses the phrase Poikile Historia to mean a “many-colored history,” a metaphor for a series of inquiries on various topics. This work was translated into Latin during the Renaissance, and as a result, it became customary among scholars to refer to the work by a Latin translation of the title, Varia Historia. The seventeenth-century scholar and poet Thomas Stanley translated the Poikile Historia into English in 1665, under the title Various History, and James Eason has transcribed an online version of Stanley’s translation. By perusing some of the chapter headings, we can get an idea of the range of topics that Aelian writes about: “How the Cretan Goats cure themselves when shot”; “Of some persons extraordinarily foolish”; “Of some who have been harmed by Laws, which they themselves made”; “Of Clinias and of Achilles, who used to repress anger by Musick”; “That they are ridiculous who think highly of themselves because of their Parents.” (Stanley’s English sounds somewhat old-fashioned to us in the twenty-first century, but this outcome is actually rather appropriate for reading Aelian, who wrote Greek in a deliberately archaic style.) Sometimes Aelian leaps from topic to topic with no sense of connection, but at other times he uses adjacent sections of his work to bring together and discuss different examples of the same phenomenon. For example, the third book of the Poikile Historia includes four sections in a row having to do with famous ancient persons who stoically endured the tragic deaths of their children, and three sections in a row on drunkenness among various ancient peoples. By forsaking systematic organization, prose miscellanies can sometimes hit upon connections between topics that might not always be possible or apparent in a highly organized treatise. Now of course, what we modern folk do with our blogs is not exactly the same; blogging is based on a very different technology, and it allows for a whole new level of interaction with readers than was possible for these ancient authors. But when I glance at chapters from the Noctes Atticae, or the Varia Historia, their methods sometimes seem similar to those employed by many blogs: take a quote, or an anecdote, or a passage from some source, and expand on it with your own thoughts, or sometimes just present the quote or anecdote or passage by itself without further comment, if that is enough to interest readers. And I particularly admire these works for embracing variety instead of treating their inherent lack of focus as some kind of defect. Sometimes the connections between topics, or the movement from one to another, is more interesting than following a single theme all the way to its logical conclusion, and this can be true for blogs as well as for ancient texts. And so my blog, A Various History, continues a long tradition of intentionally miscellaneous writing. Certainly there are many blogs out there that do more or less the same thing that I plan to do, and that don’t require classical precedents, but I like the idea of adapting an ancient form of literature to a modern, innovative mode of communication. I guess I’m just pretentious that way! Happy New Year 2015! This blog is broadly set in the tradition of the classical prose miscellany, a genre of writing that emphasizes variety of subject matter instead of more fixed or focused themes. Hence, the writings in this blog will explore a wide variety of topics. (The title, A Various History, takes its inspiration from Claudius Aelian’s Varia Historia, written during the third century A.D.) More details on the genre of classical prose miscellany, and the precedents it offers for modern blogging, in future posts.